Weekend Buried Treasure: "Ships with Sails"
Sounds pretty cool, like Santana or the Grateful Dead, doesn't it? So long as you are not fixated on the missing famous vocalist, this is a great song. And of course, that's the problem. I mentioned a while back that as a kid, I was a big fan of the Doors. Not "Jim Morrison and the Doors," as deejays often said - and still say - like the other three guys were only there for back-up, but "the Doors." Most of the group's singles, including the iconic "LIght My Fire", weren't Morrison's songs at all, but were composed by guitarist Robby Krieger (in Light My Fire, aside from vocals, Morrison's contribution was the second verse). And what would the group's legacy be without the lengthy keyboard solos on Light My Fire or Riders on the Storm? Truth be told, when I listened to their albums for the first time way back when, it was Manzarek's keyboards, not Morrison's vocals, that hooked my attention. Manzarek may just be the most overlooked musician in the history of rock'n'roll. "Ships with Sails" showcases just how good the three musicians were. At the same time, you can't help wondering how big a hit this would have been had Morrison survived to sing it. All of the songs on "Other Voices" were probably originally written for Morrison's voice. Krieger's bittersweet guitar at the end of "Ships with Sails" seems like an exclamation point on that loss. Surprisingly, if you take a look at Rolling Stone magazine's list of the best singers in rock'n'roll, Morrison only comes in at number 47 - despite having a voice as emotionally evocative as Sinatra's. Maybe that's because. just as with the adolescent poetry of Edgar Allen Poe, so I outgrew the demonic and foreboding aura that centered on Morrison. And what about the other 3 guys? Krieger and Densmore also make the list, in the 90s, as guitarist and drummer, respectively. And Manzarek? Rolling Stone lists him as the number 4 keyboardist of all time. So maybe he's not so overlooked after all. Have a nice weekend. See you on Monday. This week the initial strong showing of Industrial Production, up 1.0%, and capacity utilization, up 0.7%, were overshadowed by the outright decline in the Philly Fed index of -7.7, and the Initial Jobless claims report showing that new unemployment claims have shot up to 500,000 from 460,000 three weeks ago. July LEI were up anemically at 0.1. The general trend of the leading indicators for the last 4 months has been to converge on zero, which is about where I expect 3rd quarter GDP to wind up. The Mortgage Bankers' Association reported that "the[ir] Refinance Index increased 17.1 percent from the previous week and was the highest Refinance Index observed in the survey since the week ending May 15, 2009. The seasonally adjusted Purchase Index decreased 3.4 percent from one week earlier." The Purchase index remains above its lows from a month ago, and the overall trend of the last 6 weeks is sideways. It appears we've bottomed, but without any bounce back. The ICSC reported same store sales for the week ending August 14 rose 3.3% vs. a year earlier, and declined -1.3% from the prior week. This is still a good showing, but less so than the 4% YoY comparisons we were seeing a month ago. On the other hand, Shoppertrakreported that for the week ending August 14, YoY sales were up 6.0%, and up a slight 0.8% vs. the prior week. In general, retail sales are still holding up well. Gas prices decreased $.03 to $2.75 a gallon, back within its 3 month range, and at 9.459 million barrels consumed a day last week vs. 9.205 the same week last August. The BLS reported 500,000 new jobless claims, the highest since last November. This is obviously bad, but I continue to caution that this data series is probably still distorted due to filings by some of the 500,000 laid off census workers, and also laid off municipal (*teachers*), state, and construction/real estate employees due to the ending of those two stimulus programs this spring are also excellent candidates. Railfax continued U-turn upward from week, showing strong growth vs. last year in all 4 sectors: Cyclical, intermodal, baseline, and total traffic turned sharply up. Auto carloads rebounded strongly, but waste and scrap metal, although also turning upward, remained slightly below last year. As I have said in the last few weeks, rail traffic is suggesting that the double-dip is right now. The American Staffing Association reported that for the week ending August 8, temporary and contract employment declined by -.69%, pushing the index back down to 93 (from its two year high last week of 94). Weekly BAA commercial bond rates dropped .08% more last week to 5.78%, still showing no sign of distress as might be found if another deflationary bust had started. The good news in the Daily Treasury Statement. So far in August $91.0 B has been collected vs. $85.4 B a year ago, a gain of 6.5%. For the last 20 reporting days, we are also up about 6.5%, $12124.3 B vs. $117.0 B. As I discussed last week, this series shows that private sector employment is not declining. That daily withholding taxes continue to record substantial increases, in the face of the poor initial claims, suggests that the weakness in jobs is generally coming from the public sector. The railfax data suggests that the fall-off in housing starts has already had an effect on that sector as well. State and local governments have let go 102,000 more employees than they have added in the last three months, and economists are concerned that with revenue so depressed, school payrolls could shrink more in coming months. As I have frequently pointed out, the KISS method to be right about the economy over the next 3-6 months is simply to follow the LEI. In the past it has been documented that you won't always be right, but you'll be right a lot more often than those who claim to engage in fundamental analysis" or simply rely on what other pundits say. As you can see, they were already in steep decline in July 2008, two months before the "Black September" crash in the economy. They turned up in April 2009, 3 months before the economy as a whole bottomed. For the last four months, the best way to read them in terms of the immediate future is, converging on zero. Typically it is said that a decline in the LEI of three straight months signals a recession: we simply aren't there yet. Once again, you would be hard put to discern a trend in any one of those indicators. In any given month, a random member of the group is decisively up or down, and has not moved continuously from month to month. Again, what we see is, convergence on zero. The point of this index is that, to signal recession or recovery, at least 8 or 9 of the 10 indicators should all be moving in the same direction. We are nowhere near that yet. So far, only 3 -- ISM vendor performance, building permits, and consumer expectations -- may be negative for 6 months. Stock market performance is on the edge. Initial claims may well have tipped as well, as of yesterday. But that simply does not signal recession, rather than a slowdown, yet. The Bundesbank raised its growth forecast for Germany this year after the economy expanded at the fastest pace in two decades in the second quarter. Gross domestic product will increase by about 3 percent in 2010, the German central bank said in its monthly bulletin published in Frankfurt today, lifting its forecast from the 1.9 percent it predicted in June. Data last week showed the economy grew 2.2 percent in the three months through June, the fastest since records for a reunified Germany began in 1991. Booming global demand for German goods is fueling the recovery in Europe’s largest economy from last year’s recession, when it contracted 4.7 percent. While global growth is set to “moderate” in the second half of this year, curbing exports, domestic demand may pick up as the labor market continues to improve and consumers and companies increase spending, the Bundesbank said. Notice that about three months ago, traders thought Europe was a basket case about to fall off a cliff. Now it's a growth story. Let's take a look at the euro to see how it is faring with this change. 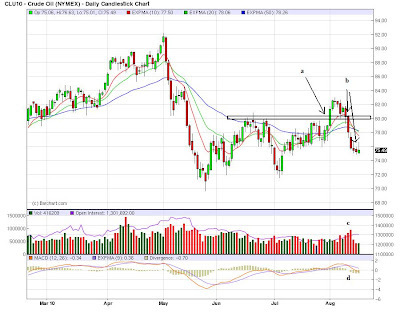 Prices have clearly rebounded from their lows (a), but ran into upside resistance at the 200 day EMA (b). 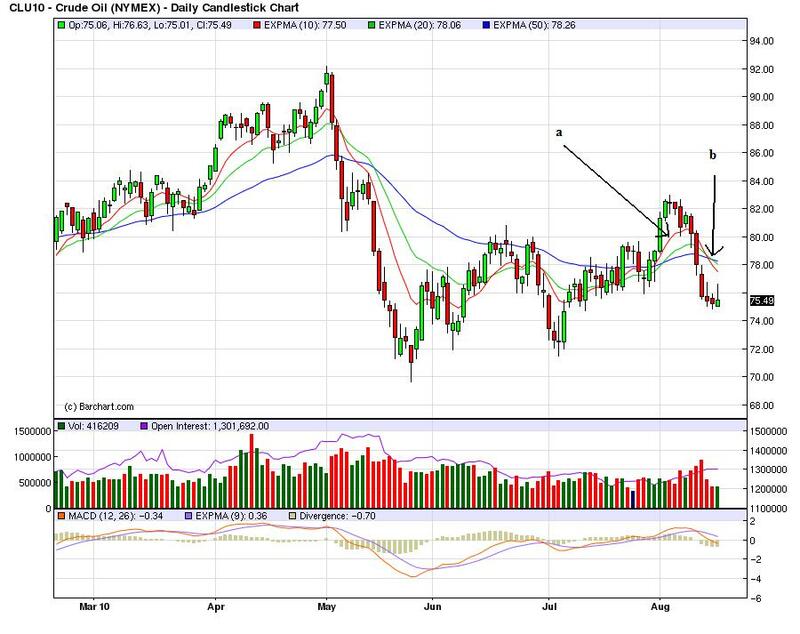 With the prices recent fall to the 50 day EMA, we've seen the 10 and 20 day EMA move lower. Also note the weak A/D and CMF readings, indicating we're not seeing a big move of fresh money into the euro. Finally, notice that the MACD has given a sell signal, indicating momentum is clearly negative. Notice that stock prices have been trading in a range for the last three and a half months. The EMA picture (a) is extremely cloudy; all the EMAs are in a very tight range. 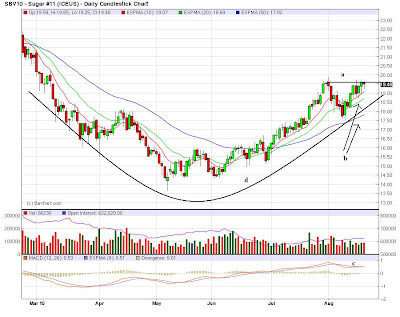 Also note that prices are centering around the 200 day EMA like it is a center of gravity for trading. Yesterday prices gapped lower at the open and then move lower with prices consolidating gains in upward sloping pennant patterns (b). Note that is the afternoon, prices tried several times to gain above the EMAs, but just didn't have the momentum. Take a closer look at the last two rallies, and you'll see some very strong bars moving higher, but with no follow-through. After rallying (a) and moving through important resistance levels (b, c and d), copper is now consolidating gains (e) in what appears to be a triangle forming. The EMAs are still moving higher, although at a slower angle (f). Also note that momentum is decreasing (f). 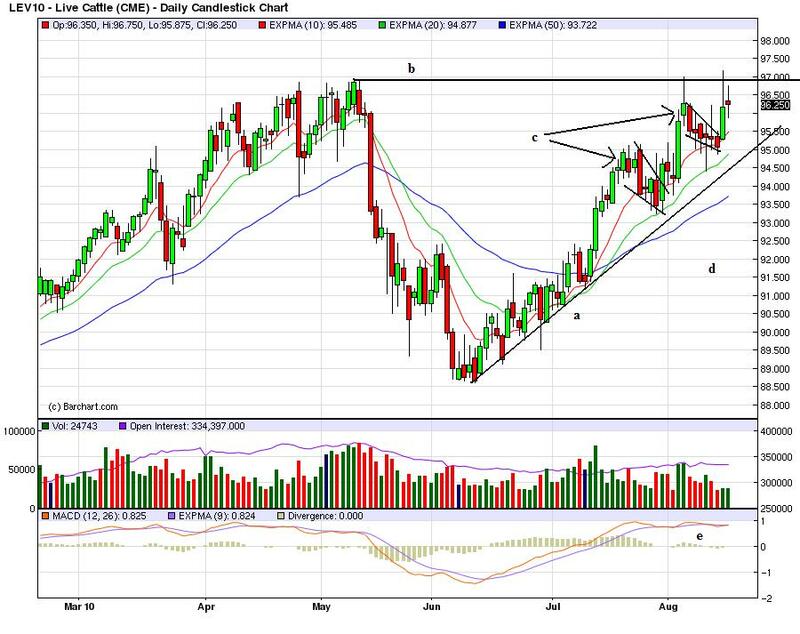 Cattle is still making new highs (a) and the EMAs are printing in a very bullish pattern (b). Sugar is in an interesting position. First, it appears prices may be forming a double top (a). However, the EMAs are still moving higher and the shorter EMAs are above the longer EMAs (b). But, the MACD is declining. 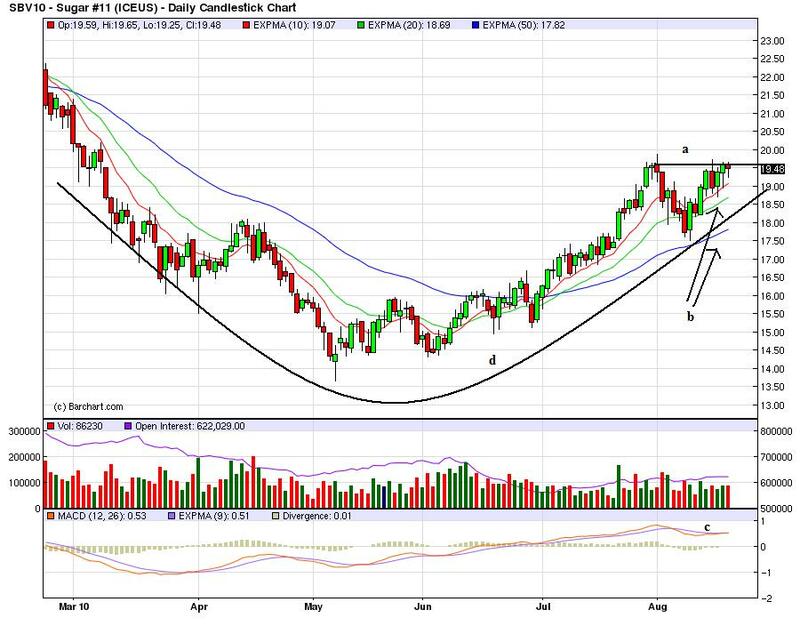 But (again), the overall 6 month pattern is a curved bottom (d). Bill McBride a/k/a Calculated Risk caused something of a stir at the beginning of July with his suggestion that, should there be a double-dip, then the NBER would probably judge it a continuation of the Recession that bottomed last June, with no intervening recovery. While I have the utmost respect for CR, and I have corresponded with him and obtained useful information from him, that doesn't mean I can't respectfully disagree. And in this case, I do. Let me preface my reasoning with a simple, straightforward statement: this is only a question of semantics. The data is, what the data is. It is either improving or declining. Regardless, few would disagree with the blunt statement that the economy is bad, the job situation is bad, and except for CEO's and Wall Street, income is bad. Nothing in the rest of this post changes any of those statements. CR's analysis is premised on the statement from the NBER that they did not consider the 1981-82 recession a continuation of the 1980 recession because all the important data measures had exceeded their pre-1980 highs before the second recession began. Unlike CR, I do not consider that the end of the argument. There is a difference between necessary and sufficient conditions for an event. I regard the NBER statement as indicating that the measures were sufficient to determine that there was a second, separate recession. Thus they did not have to engage in further analysis. In short, I do not believe they indicated that those criteria were necessary. 1. Even in 1980-82, two data points -- industrial production and real retail sales -- failed to achieve their prior highs before the second half of the double-dip. 2. Similarly, in 1938, at least two measures failed to reach their 1929 highs before falling again. 3. The NBER did not wait for all measures to exceed their pre-recession highs -- far from it -- when in July 2003 they declared the 2001 recession over. 4. The strength of the improvement in the important measures in 2009-2010 generally equals or exceeds those from 2002-03, and is comparable to that in 1980. 5. The simple length of the improving data argues that the recovery, even if it ultimately fails, has been real. CR relies on four measures to make his point: Real GDP, Industrial production, Payrolls and Real Income. As shown in the graph below, however, one of the four measures -- industrial production -- never did reach its pre-1980 recession high before the 1981 recession began. So right from the outset, we know that the failure of at least 1 critical measure to reach its pre-recession high does not rule out a real recovery. So, even considering the 1980 recession itself, it appears that 3 of 5 important measures meeting their prior highs is sufficient. While I can't show it to you graphically, accoding to the Statistical Abstract of the United States, 1939, pp. 311-312, neither real income nor payrolls had come close to equalling their 1929 highs, in both cases having made up only about half of the ground. Despite this, 1938 is not considered a continuation of the 1929-32 downturn. Rather, it has been dubbed "The recession within the depression." In other words, the 1938 recession, which did not establish new bottoms worse than the 1932-33 bottoms, was considered an interruption in the recovery from those lows, rather than an extension of the previous downturn. If a new downturn should begin that does not return us to the 2009 lows, there is no reason to consider it part of that same recession, for the same reason. Note that GDP never really even took a hit during that recession. 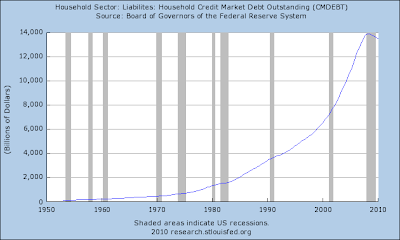 It declined in 2 of 3 quarters during 2001, but finished the recession higher than the point at which it began! 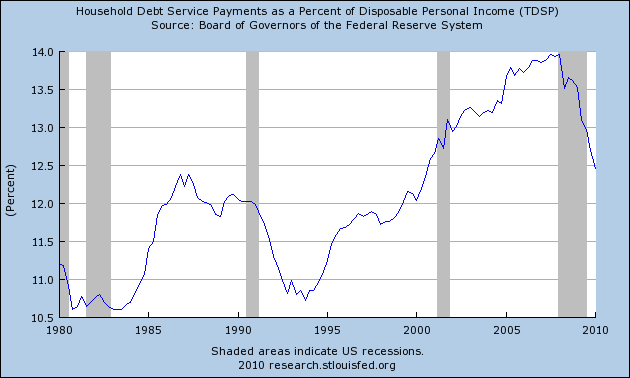 By July 2003, real income had also regained its lost ground. But industrial production had at best made up 2/3 of its lost ground, and employment was still in decline! Despite all this, the NBER declared the recession over. (The 2001 recession was a business investment recession, real retail sales never actually declined in any sustained fashion). 4. The strength of the improvement in the important measures in 2009-2010 equals or exceeds those from 2002-03 (and several of those from 1980). Since bottoming in 2009, real GDP is up about 3%. Industrial production is up 8%. Real retail sales were up 6.5% as of May. Real income is up about 1.5%. Only payrolls continue to stink, up only about 0.5% from their December bottom. A year after the end of the 2001 recession, by contrast, GDP was up about 2%. Industrial production was up 3%. Real retail sales were actually still down slightly, about -0.5%! Real income had at most been up 1.5% . And of course, payrolls were still declining. If in 2003, the NBER could consider that a period of recovery, then it certainly ought to count as a period of recovery now. Comparing with one year after the 1980 recession, GDP was up 3.5%, industrial production was up about 6%, real retail sales were up at most 4%, real income was up 10%, payrolls were up 1.5%. While real income surpassed its current growth by a very strong margin, and payrolls were significantly better, both GDP and industrial production growth were similar, and of course, real retail sales was not nearly as good as present. In short, the strength of growth in the last year is similar to that which in the past the NBER has said constituted a recovery. Finally, leaving the subjective judgments of the NBER aside for a moment, the length of the growth since last year is such that a more simple, objective approach argues that it qualifies as a recovery. Generally, in lay terms it is frequently said that a recession is 2 quarters of negative growth. The 2001 recession stretched that definition because the 2 quarters were separated by one quarter of growth. If we go by this simple rule, then two consecutive quarters of growth after a period of contraction ought to count as a recovery. We've already had 3, and everyone expects that the second quarter of 2010 will also be shown to have grown, making it four quarters in a row. For good measure, we've also had 4 quarters of growth in industrial production, 3 quarters in real income, 2 in payrolls, and 5 in real retail sales. If we lay aside subjective judgments and go by the math, that's a recovery, pure and simple. CR argues that the NBER uses a relativistic approach to dating recoveries. But if growth is judged not on its absolute strength, but only relative to the decline that preceded it, then why shouldn't the same be used for declines? How could a relativistic approach justify calling what happened in 2001 a recession at all, since compared with prior growth, it was a hiccup, and consumers blazed right through? Why should we have a relativistic measure for one side of the coin - growth - but not the other side - decline? And if we are to use a relativistic approach, consider what that means for the 1930s. The NBER would have had to wait until all the data from 1937 was in, in 1938, to declare that the Great Recession ended, in business cycle terms, 5 years earlier in March 1933! Is there anyone at all who thinks that is a useful approach? In Conclusion, obviously we can't know what the NBER will do. And, to reiterate above, we are only dealing with semantics, not facts on the ground. But there is good reason to believe that if the NBER is to be consistent with its earlier datings, once it is satisfied that any new downturn will not return us to the lows of the 2008-09 downturn, it should declare that recession ended in the later part of 2009. Initial claims are piling up, indicating that businesses are continuing to cut costs. Initial claims came in at 500,000 in the August 14 week for the largest total since November. The four-week average of 482,500 is the largest since December. A month-to-month look shows significant deterioration of 25,000 for a percentage change of nearly six percent. The Labor Department said special factors are playing no part in the data. But not all the news is negative. Continuing claims continue to come down, down 13,000 in data for the August 7 week. The four-week average of 4.527 million is the lowest of the recovery. Today's report points to trouble but not catastrophic trouble for the monthly employment report. Note the rise in initial claims betrays a lack of business confidence in the economic outlook. Stock futures are moving lower following the report while money is moving into the safety of Treasuries. This number was coming down during the last six months of last year . However, the number has stalled for this year (a) and is now at the 500,000 level (b). While I agree with NDD that the lack of underlying data means this could be a temporary increase caused by Census/governmental/construction losses, the reality is the total number could not come at a worse time. We've been seeing weakening numbers from the manufacturing sector for the last few months (see today's -7.7 print from the Philly Fed), indicating this sector -- which led us out of the recession -- is losing steam. Now we have initial unemployment claims at a big, fat round number: 500,000. That is terrible news with little to no upside in my opinion. After four quarters of GDP growth, we're seeing clear signs of weakness. 1. 500,000 new jobless claims is bad. No doubt about it. Since it is a "short" leading indicator, this just adds more confirmation that 3rd quarter GDP will be roughly zero, and could easily be negative. 2. It also means that nonfarm payrolls for August will probably stink as well. The "breakeven" point between non-census gains and losses this year has been about 475,000-480,000. BUT... We don't know what sectors the new claims are coming from. 3. The census is laying off workers more quickly than most thought. By August 7, they were down to 75,000 employees. About 500,000 census workers have been laid off in the last 13 weeks, and some of them depending on the state qualify for unemployment benefits. This will be almost over in a few weeks. 4. The Congressional aid package to the states was not big enough and it was late. We are now at the weeks when thousands of schoolteachers nationwide are finding out that they are unemployed, and you can bet that nearly 100% of them are filing for benefits. This too will probably tail off once September begins. 5. We are down about 100,000 housing starts since April. Construction workers and real estate sector finance workers have already suffered layoffs. Whether those will abate or not is unknown, but they certainly came quicker than was the case in 2006-07. 6. BP has been laying off cleanup workers in the Gulf states. This is obviously temporary too. If the increased layoffs remain concentrated in the census and in areas where the stimulus expiration has hit, there will be a reversal in September. The real danger is whether the sectors laying people off have expanded beyond that. We won't know that till the August jobs report in two weeks. In that regard, if you want to be worried, worry about the negative Philly Fed report this morning. If outright weakness is spreading to manufacturing, that is an ill omen indeed. While traders cited continuing pressure on prices from funds selling up, and farmer selling, the prospect of a weak grain harvest in Western Australia, Australia's top grain state, was helping keep bulls' hopes alive. Drought is expected to cut by 33% to 5.5m tonnes, the state's wheat harvest, the Western Australia Grains Industry Association said. While some farms had received some rain last week, "soil moisture assessment shows that most areas have little, if any, available moisture to sustain plant growth", the association said. "Should the current pattern of irregular rain with lengthy fine spells continue, it is likely that production estimates will be revised downward further in September," the group added, in a report the day after the Australian Oilseeds Federation also warned over the state's plight. Prices have broken their primary uptrend (a) at (c). In addition, note the shorter EMAs have moved lower (b). However, prices are nowhere near the highs achieved a few years ago. Yesterday, prices traded between two important technical levels, the first established over a week ago (a) and the second from the previous days trading (b). Prices moved lower at the open but found support from the previous days levels (a). Prices consolidated in a triangle pattern for the first bit of trading (b) broke through resistance anbd rallied higher forming two more triangles to consolidate gains (c). Prices hit resistance at levels established over a week ago (d) and then sold off into the close on rising volume (e). Notice how the three largest market sectors of the SPYs -- technology, financials and health care -- have been trading in a range for the last few months. The long end of the Treasury curve -- the TLTs -- has moved back above the long-term trend line (a) and has moved moved through important resistance as well (b). Also note that prices have gapped higher (c), indicating a several mis-match between supply and demand. 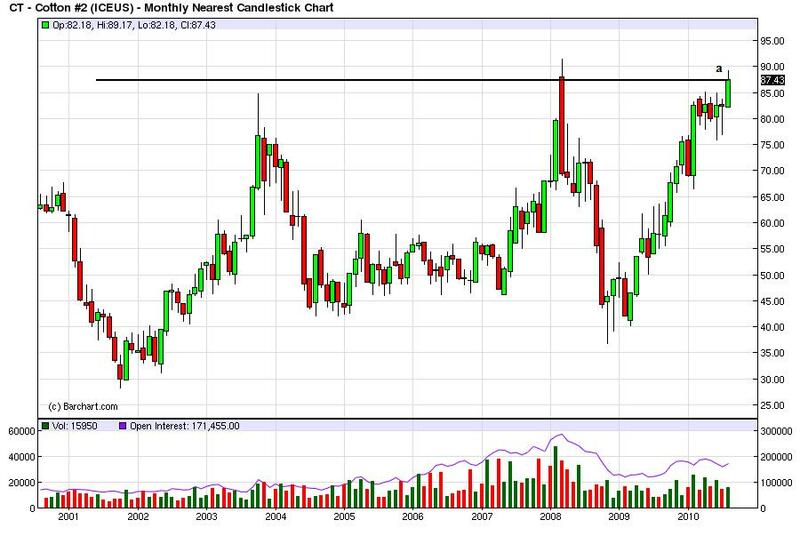 The gold market is once again in an uptrend (a). Also notice the shorter EMAs are about to cross over the longer EMAs (b) and the MACD has a lot of room to run as prices move higher (c). Yesterday the cattle market hit a 6-month high. General Motors Co. on Wednesday is expected to file for a long-awaited public offering that will take its place among the biggest IPOs in history and set the stage for the U.S. government to exit the car business. The company is reportedly looking to raise up to $16 billion, with the U.S. Treasury selling some of its shares. For taxpayers to fully get their money back, the public offering likely has to bring in about $70 billion. The latest retail sales figures show that auto sales were strong last month and the latest industrial production numbers were strong, partly as a result of auto production. 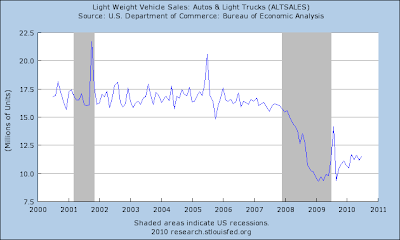 Auto sales have risen from a bottom, but have a long way to go before they hit previous levels. It's also important to ask whether or not we'll see auto sales rise to that previous levels anytime soon considering the consumer retrenchment we're seeing along with a high unemployment rate. The July survey indicated that, on net, banks had eased standards and terms over the previous three months on loans in some categories, particularly those categories affected by competitive pressures from other banks or from nonbank lenders.2 While the survey results suggest that lending conditions are beginning to ease, the improvement to date has been concentrated at large domestic banks.3 Most banks reported that demand for business and consumer loans was about unchanged. Domestic survey respondents reported having eased standards and most terms on C&I loans to firms of all sizes, a move that continues a modest unwinding of the widespread tightening that occurred over the past few years. Moreover, this is the first survey that has shown an easing of standards on C&I loans to small firms since late 2006.4 Significant net fractions of domestic banks also reported having eased their pricing of C&I loans to firms of all sizes. Banks pointed to increased competition in the market for C&I loans as an important factor behind the recent easing of terms and standards. Demand for C&I loans from large and middle-market firms and from small firms was reportedly little changed, on net, over the survey period after declining over the three months prior to the April survey. On net, large domestic banks reported having easing standards and terms on almost all of the different categories of loans to households. Other banks showed either smaller net fractions having eased lending policies or a net tightening of lending policies. Regarding residential real estate lending, a few large banks reported having eased standards on prime mortgage loans, while a modest net fraction of the remaining banks reported having tightened standards on such loans. Banks reported an increased willingness to make consumer installment loans, on balance, for the third consecutive quarter, and small net fractions of banks reported having eased standards on both credit card and other consumer loans. By contrast, small net fractions of respondents reported having tightened the terms and conditions on credit card loans. While C and I lending standards area still easing, demand (the lower box) is still weak. As with the C and I loans, standards are easing, but demand is still weak. Note that residential demand (the lower box) is fair at best. 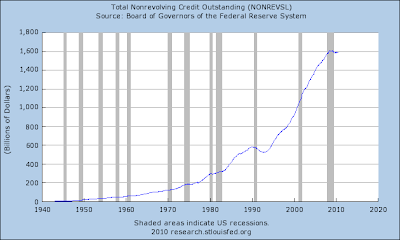 Above is a chart of commercial and industrial loans outstanding plotted on a logarithmic scale. Notice that it typically contracts around recession. While the current situation is more severe, it is hardly unprecedented; in fact, it's the norm. While real estate loans appear to be less effected by the economic cycle, they, too, have decreased around recessions as well. Finally -- and this bears repeating -- the charts above from the Federal Reserve indicate that weak demand is just as responsible for the drop in credit that we've seen over the last few years. Banks are doing what banks typically do during recessions -- they are rebuilding their balance sheets. But we're also seeing a consumer retrenchment, which I suspect will be going on for some time. To that end, see this post from yesterday. Despite all the gloom and doom about the US economy, the private sector actually created 620,000 jobs over the past seven months, far faster than in the previous two recessions. generating between 200,000 and 300,000 new jobs (excluding census workers) each month. Then, suddenly, it seemed like the bottom fell out. GDP in the second quarter is likely to ultimately be tallied well under 2%. Industrial production in June barely budged. Manufacturing cooled off. Retail sales fell over 1% in May and another 0.3% in June. Even worse, non-census hiring came to a screeching halt: about +20,000 in May, -21,000 in June, and again +12,000 in July. Talk of a "double-dip" second downturn, which had all but disappeared into the shadows in April, returned with a vengeance by July, with prominent bears like David Rosenburg proclaiming that there was better than a 50/50 chance that a second leg down was to ensue. Permabears like Mish crowed. It wasn't as if some Doom Fairy had come along and waved her black magic wand over the economy -- there were real reasons for the downturn in some of the statistics. Oil briefly at almost $90 equated to 4% of the GDP, historically the tipping point between expansion and oil shock induced recession. The explosion and sinking of BP's well in the Gulf of Mexico was an economic disaster for the Gulf of Mexico secondarily to an environmental catastrophe. The expiration of the ill-conceived $8000 housing credit caused demand to crater, subtracting about 100,000 housing starts a month, and leading to more construction and real estate industry layoffs. The failure of Congress to pass adequate and timely relief for state and local budgets meant that nearly 100,000 layoffs that would have happened last year, and could have been averted again this year, in fact took place in June and July. Instead, something happened in late April and early May to make employers and consumers alike suddenly freeze in their tracks. That something was fear. And that is where Pavlov's dogs come in. As I said last week, *why* there was such a sudden downdraft in the economy is something that economics itself does not explain well. For that, economists need to take a walk down the hall or to the faculty lounge and have a chat with their colleagues in the psychology department. I contend that what happened in April and May is a classic case of "classical conditioning." In Pavlov's experiment, the sound of the bell meant nothing to the dogs at first. After its sound was associated with the presentation of food, it became a conditioned stimulus. If a warning buzzer is associated with the shock, the animals will learn to fear it. because I foolishly previewed the video and the piglets overheard it, I have two dogs dancing around my feet who want to go for walks. The first time you burn your fingers by touching a hot stove you get the lesson to avoid doing it in the future. And now scientists are trying to know what exactly goes on in the brain that triggers such avoidance behaviour in a study on fruit flies. Just as Pavlov's dogs learned that a buzzer meant a painful shock, so most people don't have to touch a hot stove twice to learn to avoid it. As is often the case, Prof. Paul Krugman said it best: "This is not your father's recession -- it's your grandfather's." On about September 10, we saw our business fall off 30-35%. Calculated Risk accurately surmised at the time that tens of millions of American families had discussions around the dinner table amounting to "Wow, this is bad. Let's make sure our money is safe, and watch our expenditures." and thereby made the recession worse. So, when the sudden collapse in consumer spending hit, employers panicked as well. As one observer put it shortly after, "If employers needed to lay off 20, they laid off 40 just to be sure." This was the equivalent of both employers and consumers hearing a shouted warning just before they touched a hot stove. They reacted immediately and drastically to the "buzzer" (the panic in their public officials) that did actually turn out to precede very painful stimuli (a collapse in consumer demand, and over half a million layoffs a month for over half a year). What both employers and consumers learned in September 2008 and immediately thereafter, was to be alert for signs of a "Credit Freeze!" because if one occurred, very bad things were about to happen. Fast forward to springtime this year. The recovery is proceeding in V-shaped fashion in both GDP and manufacturing terms. While the consumer end started late, nevertheless since late 2009, both real income and then jobs started to increase. So well was the economy doing by the end of the first quarter that all the signs were that the hiring of March and April was likely to continue, as consumer spending and business capital purchases both moved forward. But in the background, another event began to unfold. Since the minor crisis in Dubai last December, bond yields and stock prices began to move in tandem as investors began to worry about sovereign defaults. The bears looked around for who might be the next sovereign to run into trouble, and the answer wasn't difficult to discern: Greece. German finance minister Wolfgang Schauble [ ] pleaded with his country's citizens to back a joint EU-IMF bail out for Greece worth up to €45bn (£40bn), warning that failure to act risks a financial meltdown. "The current crisis facing the euro is the biggest test Europe has faced in decades. It is an existential test and it must be overcome ... if the euro fails, then Europe fails." A second round of bank failures, and even widespread sovereign defaults in Europe were openly discussed in the media. It was against that background that the additional blows of the BP Gulf of Mexico disaster that began with the explosion of April 20. Ten days later, the $8000 mortgage credit expired, and by May 19 purchase mortgage applications had falled to a 13 year low. On May 6, there was a 10 minute "flash crash" of 1000 points on the Dow Jones Industrial Average -- which has still not been fully explained. The ECRI weekly leading indicator -- which had gained notoriety with the group's gutsy recovery call in March 2009 -- plunged back into negative territory, and was widely reported in the media. And states and localities warned about draconian cuts of personnel and services in summer if Congressional emergency funding didn't come through. It is important to note that, except for the BP disaster, none of the actual economic consequences of any of these items were actually being felt yet. But what employers and consumers thought they were hearing -- especially due to the Euro crisis -- was a warning that we were about to endure another Credit freeze! To use the "hot stove" analogy, they heard a warning that they were about to touch one again. Once burned, twice shy. And they reacted the way they had been classically conditioned by September 2008 to act. Employers froze hiring plans immediately. And consumers cut back on spending, retrenching in fear of another round of 100,000s of layoffs. Only that explains the precipitous halt in employer hiring, and consumer spending, that took place immediately in May and continued in June. And most of the other crises have passed as well. BP finally capped its well in mid-July. Mortgage applications bottomed in mid-July as well, and have ever so slightly improved in the four weeks since. The DJIA rose 10% from its early July bottom. Congress passed at least some relief for the states. Only Oil, still ranging between $70-$82 a barrel, remains an unresolved drag on the economy. There are signs that consumers have come back out of their cave. July retail sale were up 0.4%, the first gain in real, inflation adjusted retail sales since April. Housing permits rose slightly in June, and then fell again slightly back to May's levels, in July. 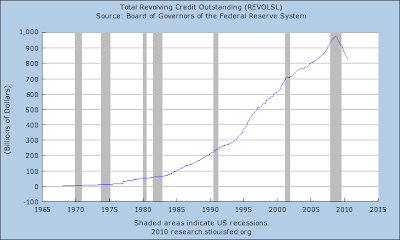 It seems that consumers have begun to decide that the "credit freeze!" may not happen again after all. On the employer side, hiring of temporary help has resumed, as the American Staffing Associaton's index just reached a two-year high. Of course, the fear of a steep downturn could yet be a self-fulfilling prophecy. Recall my quip above. When he played back his video, John Cole hadn't intended to take his dogs for a walk, but the dogs thought otherwise. He may well have given in and taken them for a walk after all. On the other hand, if he didn't, Cole's dogs probably settled back down. Similarly, while the loss of 100,000 in housing starts is a blow, it need not create a "double-dip", and states and localities may be able to pull back from the worst with the new infusion of federal cash (together with improving tax receipts). A near zero GDP for the third quarter looks baked in the cake. But if there isn't another "exogenous event" like the BP catastrophe in the next couple of months, and if there are no renewed fears of a "credit freeze!" in Europe or elsewhere, consumers may gradually resume their spending habits from before May, and private employers may resume hiring at spring's pace. Yesterday, prices gapped higher at the open (a), and then on declining volume found support at the EMAs where prices jumped higher (b) on rising volume. 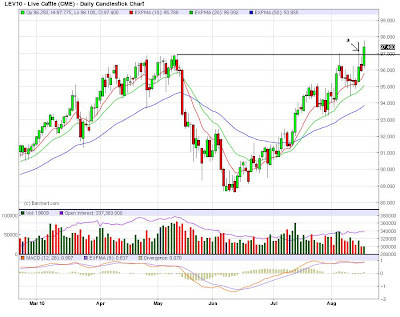 After rising, prices again found support at the EMAs (c) and rose a bit higher. But prices then started falling, and found resistance rather than support at the EMAs in the afternoon (d, e and f). Finally, notice the increasing volume in the afternoon. Notice how prices found resistance at key levels from several days ago (a). The bond market is still in the middle of a strong, 10-day rally (a). Notice the large number of gaps higher (b), usually followed by periods of consolidation (c). 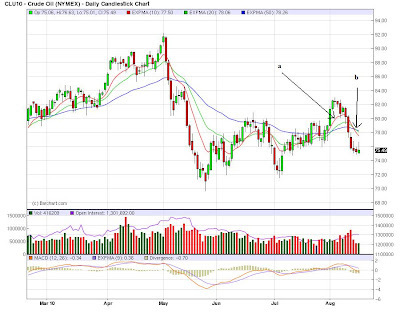 After moving through the 80/bbl area (a), oil fell through the 80 area, with prices now below the EMAs (b). Notice the increased volume on the sell-off (c) and the sell signal from the MACD (d). Notice how quickly the EMA picture can change. About two weeks ago the EMAs were moving into bullish territory with the shorter EMAs above the longer and the shorter EMAs rising (a). Now the shorter EMAs have crossed below the 50 day EMA indicating a short-term bearish orientation to the market. 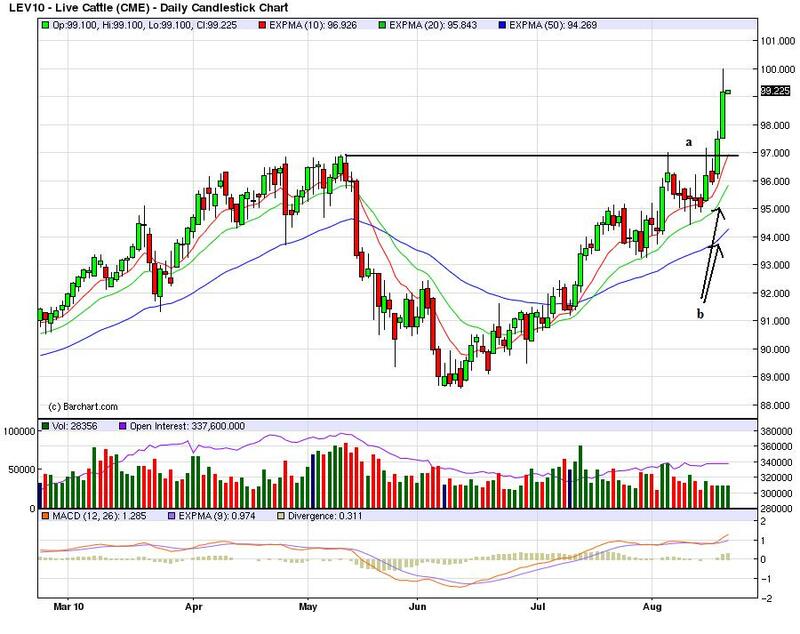 Finally, the cattle market is in a clear long-term uptrend (a). 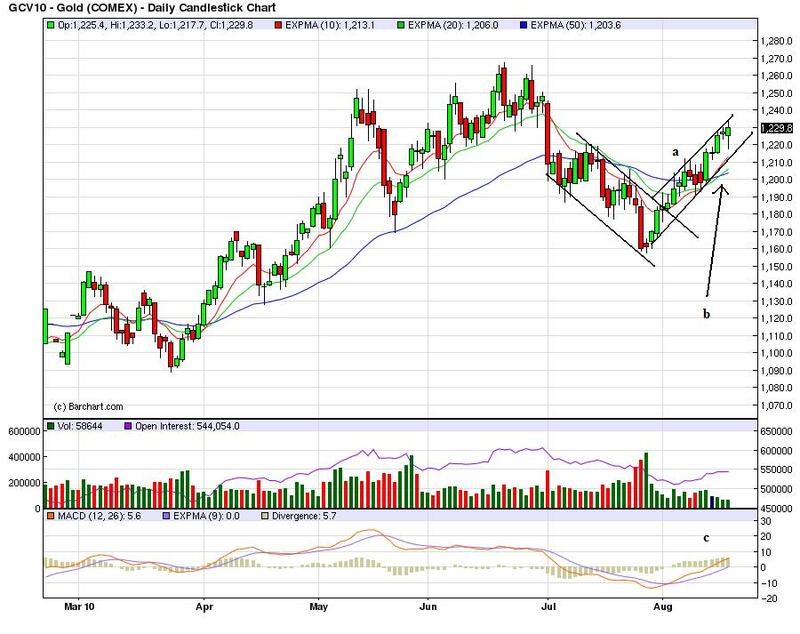 Prices have consolidated along the way (c) and are currently approaching six month highs (b). However, there is a question whether or not prices can keep up the momentum (e). American households pared their debts last quarter, closing credit card accounts and taking out fewer mortgages as unemployment persisted near a 26-year high, a survey by the Federal Reserve Bank of New York showed. Consumer indebtedness totaled $11.7 trillion at the end of June, a decline of 1.5 percent from the previous three months and down 6.5 percent from its peak in the third quarter of 2008, according to the New York Fed’s first quarterly report on household debt and credit. The report reinforces forecasts for a slowing economy in the second half of 2010 as consumers hold back on spending and rebuild savings. The Fed last week said the recovery would be “more modest” than it had anticipated and announced it would keep its securities holdings at $2.05 trillion to prevent money from draining out of the financial system. 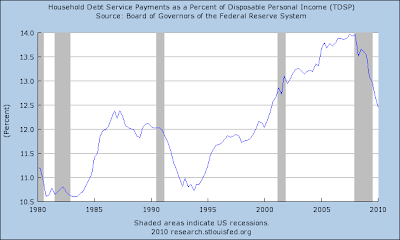 Debt service payments are decreasing as a percentage of disposable income. 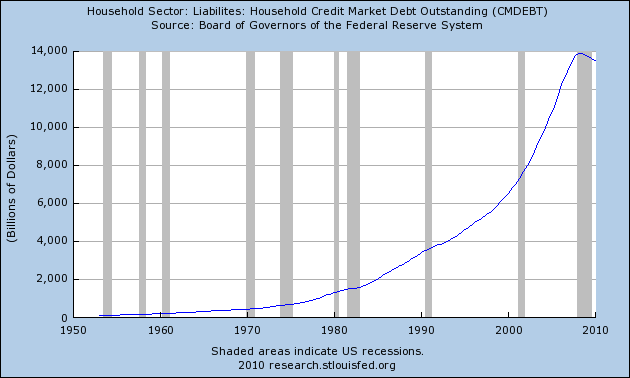 Largely as a result of a decrease in revolving debt. 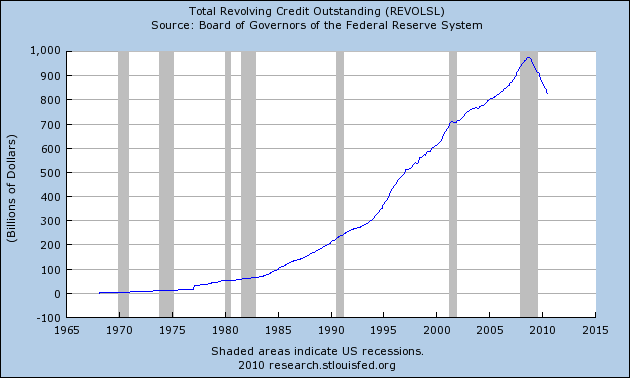 While non-revolving debt has been stagnant. Industrial production rose 1.0 percent in July after having edged down 0.1 percent in June, and manufacturing output moved up 1.1 percent in July after having fallen 0.5 percent in June. A large contributor to the jump in manufacturing output in July was an increase of nearly 10 percent in the production of motor vehicles and parts; even so, manufacturing production excluding motor vehicles and parts advanced 0.6 percent. The output of mines rose 0.9 percent, and the output of utilities increased 0.1 percent. At 93.4 percent of its 2007 average, total industrial production in July was 7.7 percent above its year-earlier level. The capacity utilization rate for total industry moved up to 74.8 percent, a rate 5.7 percentage points above the rate from a year earlier but 5.8 percentage points below its average from 1972 to 2009. This is a great number, plain and simple. First, auto manufacturing is jumping. That indicates two things. First, demand is increasing. 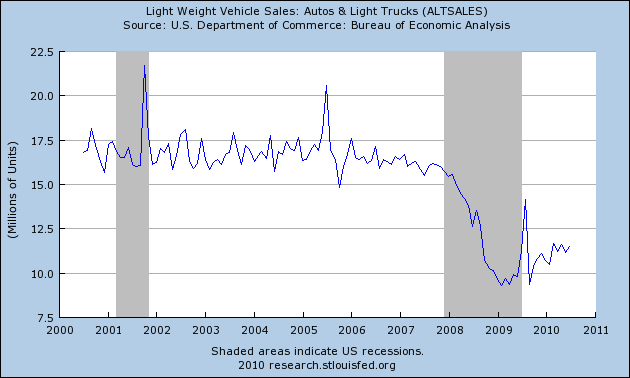 This is evidenced by the increase in auto sales in the latest retail sales numbers. Secondly, there have been stories about auto dealerships being under-supplied. I think the auto companies are cranking up production to increase inventories. But we're seeing a healthy .6% increase without auto production. And according to the report, the increase was broad based. The chart above shows that all areas of production increased. In addition, notice that capacity utilization has been increasing as well on a consistent basis. While still below the pre-recession levels, industrial production continues its upward climb. Capacity utilization also continues to increase. We've seen some weakness in the manufacturing numbers over the last few months. Considering the overall strength of this number I have to wonder if that trend will continue. Manufacturing pulled the economy out of the recession. Now it appears it is losing steam. Part of my thesis for this recovery is that various parts will emerge at various times, but there will not be a cohesive "expanding on all fronts" scenario. That is, instead of having consumers and manufacturers humming along at the same time, we'll see very lumpy growth. Manufacturing has provided part of the first leg of the recovery. Now we'll see if other parts of the economy pick-up. 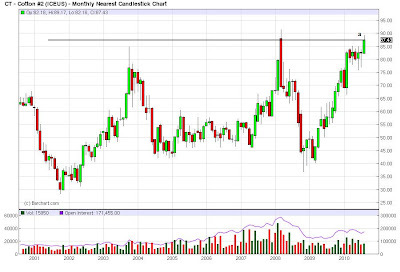 Let's start in the cotton market, which is near multi-year highs. 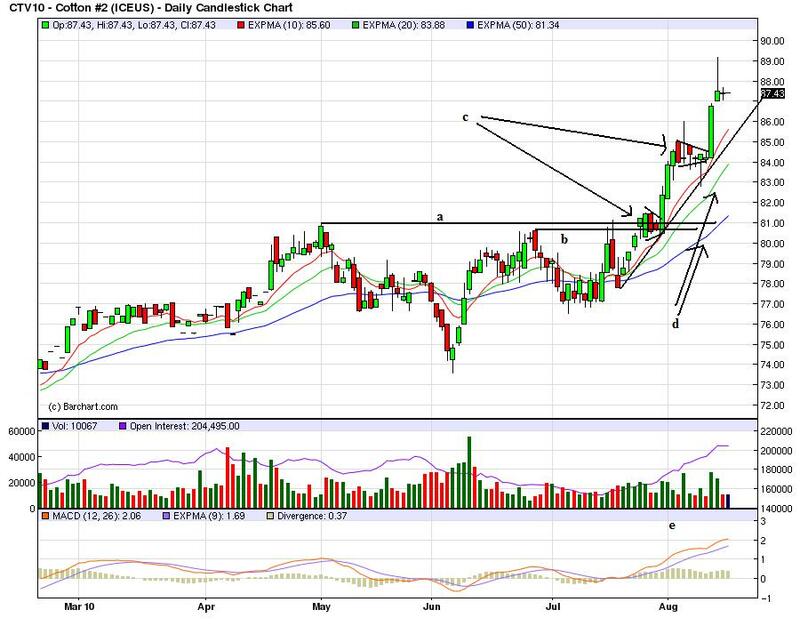 The chart is classic break from a consolidating area. 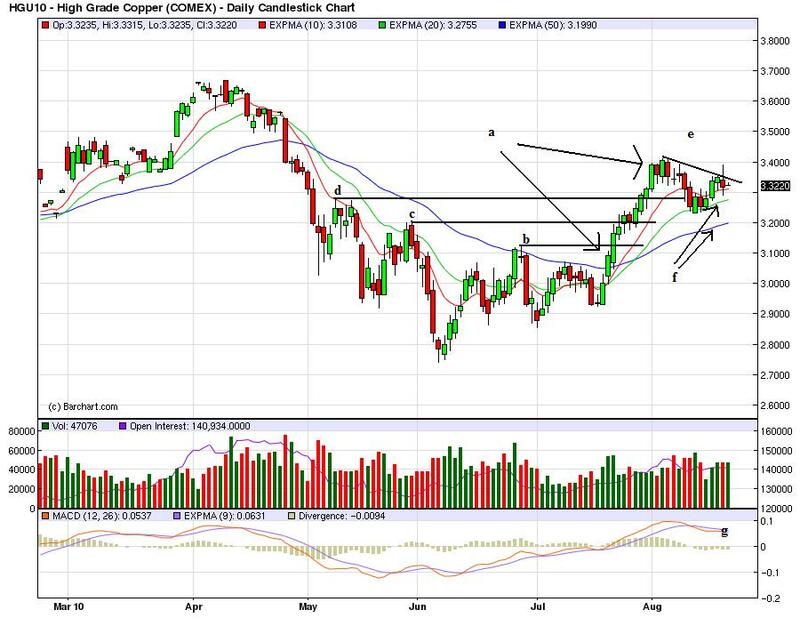 Prices have moved through resistance (a and b) and have consolidated their gains along the way (c). Also note that prices have printed strong bars after the consolidation. 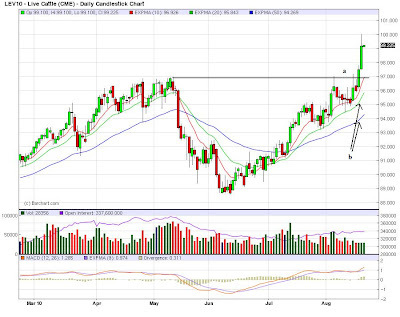 The EMAs are very bullish -- the shorter EMAs are above the longer EMAs and all the EMAs are moving higher (d). Also note that momentum is increasing (e). The wheat market is cooling off a bit. 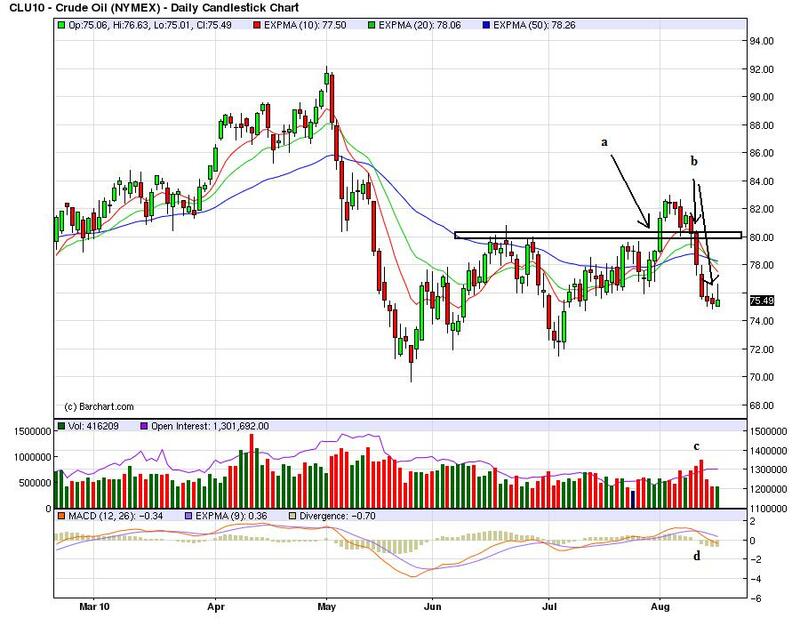 Prices have fallen from their highs (a), consolidated in a triangle pattern along the 10 day EMA (b) and are now using the 20 day EMA as technical support (c). Prices have broken the long-term uptrend (d) and the MACD has given a sell-signal (e). 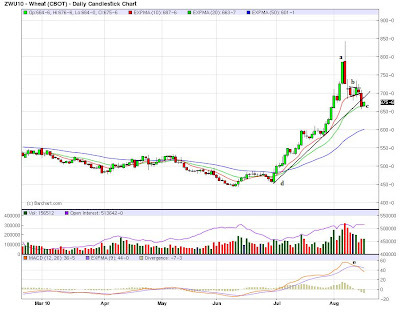 Soy beans have risen in sympathy with wheat. Prices are in a clear uptrend (c). 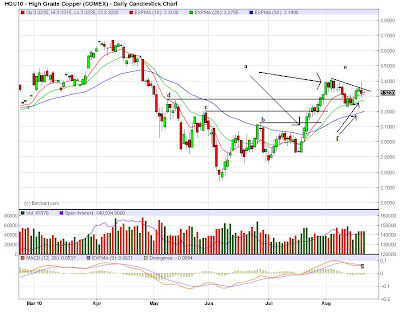 Prices have moved through resistance (a) and have consolidated gains (b) using the EMAs as support (b). 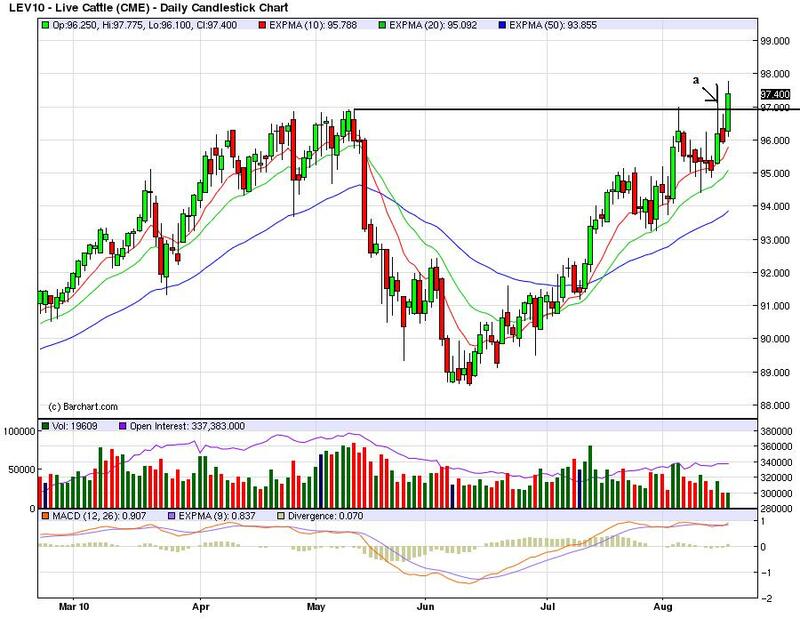 The EMAs are bullish (d) but the MACD is losing its momentum (e). The bond market is still in a very strong rally. 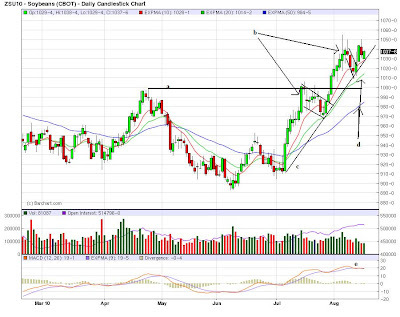 First, note that prices have moved strongly above the trend line (a), gapping higher and printing strong bars (a). On the technical side, the EMAs are still very bullish (a) -- all are moving higher and the shorter are above the longer. We're seeing more money flow into the market (b and c) and momentum clearly move higher (d). Yesterday, prices gapped lower at the open (a), but quickly closed the gap (b). However, prices could maintain momentum and moved lower, using the EMAs are support. They rose again before lunch, but had a hard time moving beyond Friday's close. They dropped twice after lunch (d and e) but rallied into the close on rising volume (f).